Unfortunately for those who hold that belief, the objective data tells us exactly the opposite, i.e., that technology-based training (TBT) is superior to instructor-led training (ILT) according to every metric in existence. Most of us would probably guess that TBT has a cost advantage. It does, and it’s huge, but TBT is also superior in every other way that training is evaluated. Throughout the world, technology-based training is changing the way corporations and individuals obtain skills in almost every segment of the business process. Initially, information technology training dominated the TBT market. Now, however, front office, management, marketing, sales, customer service and professional development training are shifting to TBT at a rapid rate. Technology Based Training (TBT) is a computer-based training methodology that includes web-based, intranet-based, DVD- and CD-based training on any topic. Instructor-Led Training (ILT) is the practice of training and learning material between an instructor and learners, either individuals or groups. Instructors can also be referred to as facilitators who may be knowledgeable and experienced in the learning material, or may be selected more for their facilitation skills and ability to deliver material to learners. quickly scan a course module list and find the lesson they need without wading through pages of unnecessary content. Instructional efficiency means “gained knowledge or skills” divided by “all information delivered.” It’s the percentage of the information delivered that leads to learning that improves performance. If only 15 minutes of a one-hour class is relevant, the class was 25% efficient because the learner had to sit through 45 minutes of unnecessary material. If an e-learner is able to skip 45 minutes of material, allowing them to focus exclusively on the 15 minutes of new material, the efficiency of the online class would equal 100%. It is this efficiency that gives e-learning the 2:1 time advantage it enjoys over instructor-led training, according to Brandon Hall. In general, a learner will need half the time to cover the same material in an online class as they would in an instructor-led class. Learning Velocity/Instructional Speed refers to how quickly a program can be developed and delivered across an organization, its timeliness and consistency, and ease of updating material. Learner opportunity costs: The cost to an organization of having learners be away from their jobs. Educators agree that a lack of student interaction is a leading contributor to the failure of the standard classroom and textbook-oriented learning environment. TBT captures the student’s attention, and keeps it with a high level of interaction. Through rich multimedia, TBT courses are designed to gain and maintain interest through the extensive use of video, graphics and animation to illustrate and explain concepts, and by ensuring there is a high degree of interactivity with the student. Studies have shown that the more senses involved in learning, the higher the retention rate. Whereas the average content retention rate for an instructor-led class is only 58%, the more intensive TBT experience enhances the retention rate by an additional 25 – 60%. Higher retention of the material yields a higher return on every dollar spent on training. TBT leads to a faster learning curve compared to instructor-led training. Delivering content in smaller units, called “learning objects” contributes further to saving time and has a more lasting learning effect (see Learning Objects definition). Since learners can customize the learning material to their own needs, they have more control over their learning process and can better understand the material, leading to a 60% faster learning curve, compared to instructor-led training. Instructor-led training requires more total time to implement than e-learning because training must occur at a specific location or locations, at specific times, which can delay training and limit its frequency. This may also require travel time. TBT has the ability to keep fast-changing content current, dynamic, and refreshed, unlike books or instructor-led programs that rely on physical materials such as workbooks, exercises, etc. TBT is quickly adaptable to market and technological changes. Instructor-led training must coordinate the schedules of the instructor, the learner, and the training facility on a specific date. TBT doesn’t require such coordination; it can be delivered whenever it’s convenient for the learners. Students taking an online course enter a risk-free environment in which they can try new things and make mistakes without exposing themselves. This characteristic is particularly valuable when trying to learn soft skills, such as leadership and decision-making. A good learning program shows the consequences of students’ actions and where/why they went wrong. After a failure, students can go back and try again. This type of learning experience eliminates the embarrassment of failure in front of a group. TBT courses are delivered consistently each time and for each participant, unlike instructor-led training, which has a risk of different messages or different interpretations of the content being delivered by different instructors. TBT consistently conveys the same messages and emphases. Anyone who has watched the same theatrical production by different casts in different cities understands that, even though the dialog, music, and choreography are nominally identical, those productions are noticeably different from each other due to the personal influences of local directors and performers. Each is a different show. TBT is up to 90% less expensive than instructor led training. ILT cost factors include course development, instructor time, instructor salaries, preparation time, classroom/conference room costs, travel expenses, material costs, and employees’ time. Prep times include setting-up the room and getting materials ready for the class. Post-class activities include clean-up of the room and reviewing participant evaluations. TBT has none of the ILT cost burdens except development. However, because TBT is scalable, i.e., can be made available to an infinite number of learners at no additional unit cost, development costs are amortized over tens- or hundreds of thousands of learners, not dozens. This efficiency is reflected in pricing. Because learning occurs over the Internet, learners don't need to travel to learn from proven leading experts, or be constrained by experts’ limited availability. You’re not limited to the expertise you can hire locally, or pay to have experts travel to your students. Students can learn anywhere, anytime via 24/7 Internet access. Students train according to their own preferences and learning pace. TBT eliminates time- and geographic constraints. Students can navigate through the training to cover topics in whatever order is most beneficial in light of their specific training needs. This allows students to select topics, or to be directed to content that meets their level of knowledge, interest and what they need to know to perform more effectively in their particular activity. TBT also enables just-in-time training, and reinforcement for immediate real-world challenges or opportunities. Students learn at their own pace, further increasing skill retention. They’re not constrained by an instructor-led class that’s too fast or too slow. With TBT, you can evaluate acquired knowledge throughout the course with embedded testing or, in the case of scenario-based simulations, continuously as learners progress. TBT enables “just-in-time learning” for quick solutions to required needs as opposed to voluminous “just in case” learning, which often does not improve performance. A branch of the US military estimated that their technicians’ ability to troubleshoot problems increased by 90% after the adoption of multimedia training, and found an increase in ability of personnel to correctly diagnose and repair aircraft systems by more than 80%. When real-time interactivity was introduced, the retention rate of the trainees was raised from about 20 percent (using ordinary classroom methods) to about 75%. There is very strong evidence that computer-based training requires less time for training compared to instructor-led training. The amount of reduction ranges from 20-80 percent, with 40-60 percent being the most common. Technology-Based Training produced a 60% faster learning curve as compared to traditional instruction. Over 30 studies have found that interactive technologies reduce learning time requirements by an average of 50%. Office Depot used a virtual classroom to simultaneously train students in FL, CA and TX, thus increasing enrollment by a factor of three while increasing student satisfaction by 30% and knowledge retention by 25% while simultaneously decreasing costs by 80%. A major consultancy firm developed and delivered computer-based training for 7,000 consultants in 50 countries. The cost of the training was $106 per student, versus and estimated $760 per student for instructor-led delivery. Over the five-year lifespan of the program, technology-based training saved the firm more than $4.5 million. A major transportation company reported an increase in bottom-line performance of over 35%, which equated to millions in increased revenues and savings. Learners showed 40% increase in learning retention and improved attitudes about management jobs, new company-wide processes implemented 12 months earlier than possible with traditional training. White Paper: Is Web-Based Training Right for You? "If you are not being educated in your job today, you may be out of a job tomorrow...” Employee education is not growing 100 percent faster than academia, but 100 times - or 10,000 percent - faster. Over the next few decades, the private sector will eclipse the public sector and become the major institution responsible for learning." What I hear, I forget; what I see, I remember; but what I do, I understand. 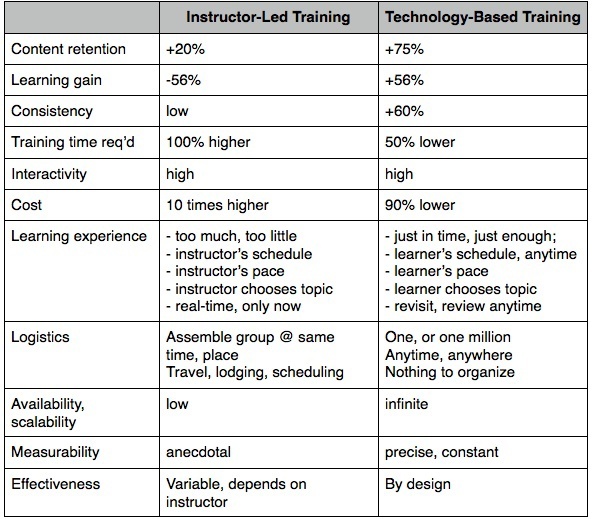 E-Learning Training vs. Instructor-Led Training. Diana McLeod, San Francisco State University, 2006. Technology has revolutionized business; now it must revolutionize learning. In the 21st century, people have to learn more than ever before. Especially for global organizations, live classroom-based training is becoming too costly and cumbersome. Even if employees had the time to attend all the courses and seminars and to read all the books and reports they should to remain up-to-date in their area of work, the cost of such learning would be prohibitive. The need to transform how organizations learn points to a more modern, efficient, and flexible alternative: eLearning. The mission of corporate eLearning is to supply the workforce with an up-to-date and cost-effective program that yields motivated, skilled, and loyal knowledge workers. The growth of the World Wide Web, high-capacity corporate networks, and high-speed desktop computers make learning available to people 24 hours a day, seven days a week around the globe. This enables businesses to distribute training to multiple locations easily and conveniently. Employees can then access training when it is convenient for them, at home or in the office. When delivered through technology-based solutions, training is less expensive per end user due to scalable distribution and the elimination of high salaries for trainers and consultants. The biggest benefit of eLearning, however, is that it eliminates the expense and inconvenience of getting the instructor and students in the same place. According to Training Magazine, corporations save between 50-70% when replacing instructor-led training with electronic content delivery. Opting for eLearning also means that courses can be pared into shorter sessions and spread out over several days or weeks so that the business would not lose an employee for entire days at a time. Workers can also improve productivity and use their own time more efficiently, as they no longer need to travel or fight rush-hour traffic to get to a class. Information can be retrieved just before it is required, rather than being learned once in a classroom and subsequently forgotten. Training Magazine reported that technology-based training has proven to have a 50-60% better consistency of learning than traditional classroom learning (c-learning). Technology-based solutions allow more room for individual differences in learning styles. They also provide a high level of simulation that can be tailored to the learner's level of proficiency. With 24 x 7 access, people can learn at their own pace and review course material as often as needed. Since they can customize the learning material to their own needs, students have more control over their learning process and can better understand the material, leading to a 60% faster learning curve, compared to instructor-led training. The delivery of content in smaller units, called "chunks," contributes further to a more lasting learning effect. Whereas the average content retention rate for an instructor-led class is only 58%, the more intensive eLearning experience enhances the retention rate by 25 - 60%. Higher retention of the material puts a higher value on every dollar spent on training. Students taking an online course enter a risk-free environment in which they can try new things and make mistakes without exposing themselves. This characteristic is particularly valuable when trying to learn soft skills, such as leadership and decision making. A good learning program shows the consequences of students' actions and here/why they went wrong. After a failure, students can go back and try again. This type of learning experience eliminates the embarrassment of failure in front of a group.